Do you love french fries? Have you ever thought about creating an all you can eat french fry buffet in your restaurant? Come on, sure you have, fries are good and simply delicious. People of all ages love these tasty crispy treats. If you don’t really think a french fry bar would work in your restaurant, perhaps, you just want to put some delicious fries in wood cones and serve them up in wood stands by featuring them on the tables in your establishment. Look how great fries looked featured in wood cones, your customers are going to be jumping for joy when they see this presentation on the tables in your joint. 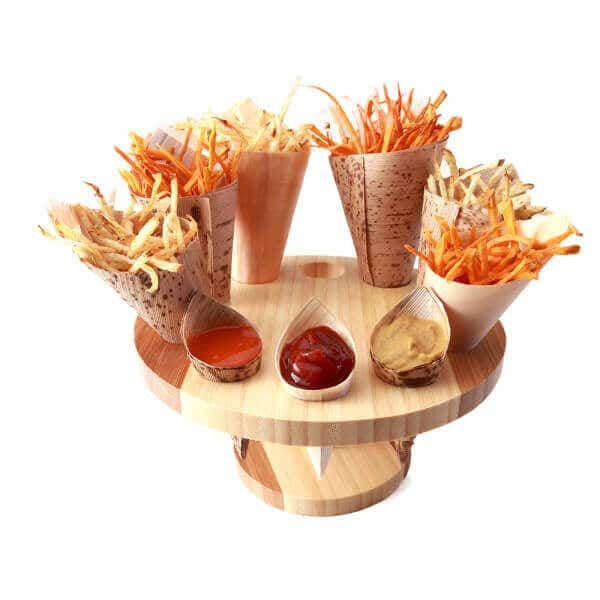 Wood cone stands make amazing french fry holders. Heat oil up in a deep pan, until it reaches 365 degrees F. It is best to use a thermometer to make sure the oil gets to the right temperature. While your oil is heating up, clean your potatoes, then using a mandolin or vegetable slicer, thinly slice them. After you clean and cut potatoes, put them in a bowl of cool water, then toss them in a salad spinner to dry them. You can also place them on paper towels, if you don’t have a salad spinner handy. The goal is to make the potatoes dry and water free so they cook better in the oil. Now, just place potatoes (in batches) into the heated oil and cook until they are crispy and brown. Take potatoes out of oil, place on a plate lined with a paper towel, then place some of them in each of your wood cones and put the cone into a slot that is in your wood cone stand. Display on your dining room tables or a buffet station.